PRESIDENT MICHAEL D Higgins has said that the “disastrous consequences of an appalling property bubble” have left many Irish people in poverty they have never before experienced. 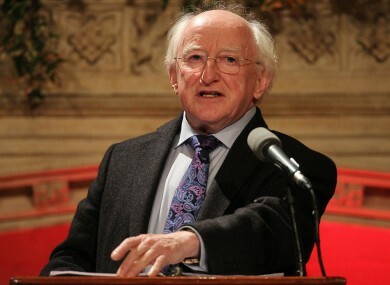 In a wide-ranging interview with TheJournal.ie at Áras an Uachtaráin yesterday, President Higgins said that during his first year in office he has witnessed “a great anger in the country”. He said: “There is no doubt whatever that some of the institutions and professions in which people placed their trust have let people down, and let people down for the shallowest of reasons. The President identified youth unemployment as the biggest problem across the European Union as he spoke prior to his first presidential seminar being held at the Áras today. The theme of Being Young and Irish is to be discussed by 100 young people in the presence of government officials and the Children’s Minister Frances Fitzgerald at a seminar in the Áras this afternoon. Higgins hopes that the event will allow young people to articulate their vision for Ireland and how that vision might be achieved. The project has been running for the last six months with over 700 submissions to it and four workshops, attended by the President, being held across the country. Contributions ranged from three young people in prison – who the President later went to meet – to some of the Irish diaspora who had been forced to emigrate due to the current economic climate. “There were common themes and seven hundred people is a fair old consultation. I would have liked if it is was more but it was very, very informative,” he said. Higgins said that among the themes to emerge were equality, specifically gender equality, equality of opportunities and equality of participation. He said: “Young people are saying that they want, for example, educational arrangements to be such that everyone doesn’t have to develop at the same age and the same time. That there should be a pace that is taken into account. Listen: In part 2, the President talks about the highlights of his first year in office, the demands of the job and the bend in his knee! The President outlined some of the practical solutions that young people had offered including for civics to be taught more at second level as well as introduction of philosophy in secondary schools. There were calls too from young people for unfinished housing estates to be finished and handed back to communities. “In a curious way, it’s [the working document from the project] a more reflective piece than you would find from some very serious and often pretentious interviews with those who you feel could tell us what the Irish economy is all about,” he said. On his first year in office, the president said that he had changed protocols in order to allow people to speak more freely with him at public events and said that he would continue to visit parts of the country where he felt his presence would help. “I decided very deliberately that I would use the first two years in particular to go to communities where the presence of the President might make a difference,” he said. The Being Young and Irish initiative is part of what he described as a “transformative agenda” that he had undertaken while at the same time continuing to respect the constitutional limits of his office, which he acknowledged almost immediately on his election last year when he resigned from the Labour Party. Given the considerable coverage this past week of the controversial death of Savita Halappanavar at Galway University Hospital, TheJournal.ie asked if it would be possible to discuss the matter with the President. However he cited the constitutional limits of his office as a reason for his wish not to discuss the case. But Higgins said there had been no interference from government in any of the speeches he has given or other public engagements in the past 12 months. “I’ve not been asked to curb anything,” he said, adding that he does not feel he must refrain from speaking his mind on issues concerning Irish society. Higgins also spoke about his now infamous confrontation with Tea Party commentator Michael Graham on Newstalk radio two years ago, a recording of which recently went viral around the world. Higgins said he received over 250 messages about the recording, which he said was “in my previous life”, recently, only six of which referred to his use of the word ‘wanker’ to describe Graham. With Ireland’s presidency of the European Union he expects to be busy and hopes to return the State visit of Queen Elizabeth II to Ireland last year by visiting the UK either late next year or early in 2014. Read: One year after #Aras11, where are the failed presidential candidates now? Email “Interview: 'There is a great anger in the country' - President Higgins”. Feedback on “Interview: 'There is a great anger in the country' - President Higgins”.